Home » Thoughts from The Sage » Welcome to the Blog! You probably are wondering what this post has to do with MMS and soap making. Sadly, I do not have any brilliant advice or amazing recipes to open this blog. I will remedy that dilemma quickly! I can offer one of our favorite pictures and a story instead. 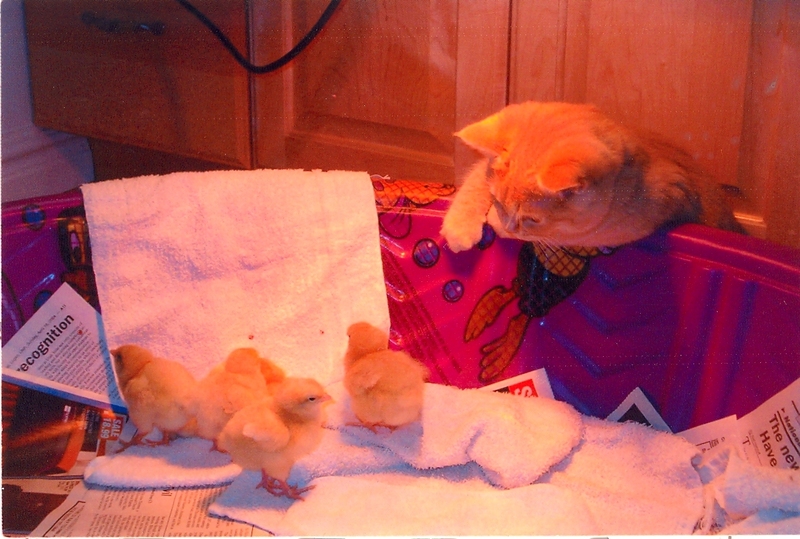 Leo is one of my family’s many pet animals and he loves watching our new chicks when we get them. We were able to capture this cute picture of him leaning over the edge of the kiddie pool that contains our new baby chicks. We do have to watch him though! He keeps on trying to pat the chicks on the head with his paw! However, he isn’t trying to eat them. Leo’s method of showing approval is to pat with his paw. Leo will even jump into the pool to take a nap and let the chicks snuggle with him. I think he regards these chicks as his own personal harem! As the year progresses, I will find more pictures from our photo albums to share. Maybe I’ll be able to find one of Leo with the chickens as adults! Welcome to the New Year and the new Majestic Mountain Sage Blog! Wow! I’m so excited to see that you have a BLOG now. Awesome! I’m looking forward to reading it. Pingback: Adventures With The Sage » Blog Archive » Wowza! We’ve Written Over 1000 Blogs!